Ridley Scott has quietly become one of Hollywood’s most prolific directors – yet the consistency in his output (seven films in the past eight years) doesn’t translate into a consistency in quality. There is something admirable about Scott increasing his work output despite being long past retirement age, and the films he’s making are some of the riskiest propositions in his filmography since Blade Runner over three decades ago. After last summer’s Alien: Covenant, a financial disappointment largely due to being one of the most nihilistic mass market movies in recent memory, he’s now back in more conventionally commercially friendly territory with All the Money in the World. Yet despite the mainstream appeal of this latest thriller, it’s one of his ballsiest cinematic outings in his long and eclectic filmography- and unlike ambitious recent efforts like the recent Alien prequels and The Counsellor, this one is knocked out of the park with no teething problems at all. In 1973, the grandson of oil tycoon John Paul Getty is kidnapped in Italy, and held for a $17 million dollar ransom. Getty isn’t just the richest man alive, but the richest man to have ever lived – yet maintains a perennial stinginess and refuses to pay a single penny to the kidnappers. Instead, he sends out Getty Oil negotiator Fletcher Chase (Mark Wahlberg), along with his former daughter-in-law Gail Harris (Michelle Williams) to Rome to try and track down the grandson he claims to love, but fails to act on. By now, you’ll be fully aware that this movie’s existence in its current form is a minor miracle. Six weeks prior to the film’s release, Ridley Scott made the unprecedented decision of reshooting Kevin Spacey’s role with Christopher Plummer, and wasn’t planning on pushing the release date further in to the future to accommodate this. Plummer’s entire performance was shot within the space of a week. Williams and Wahlberg both agreed to reshoot the relevant scenes for no extra cost, and the rest is cinema history. Of course, the main reason this took place was to ensure the film got released before the upcoming Danny Boyle-directed TV series about the kidnapping (starring Donald Sutherland as Getty) premiered on the small screen. But this cynical fact doesn’t detract from an impressive filmmaking feat. 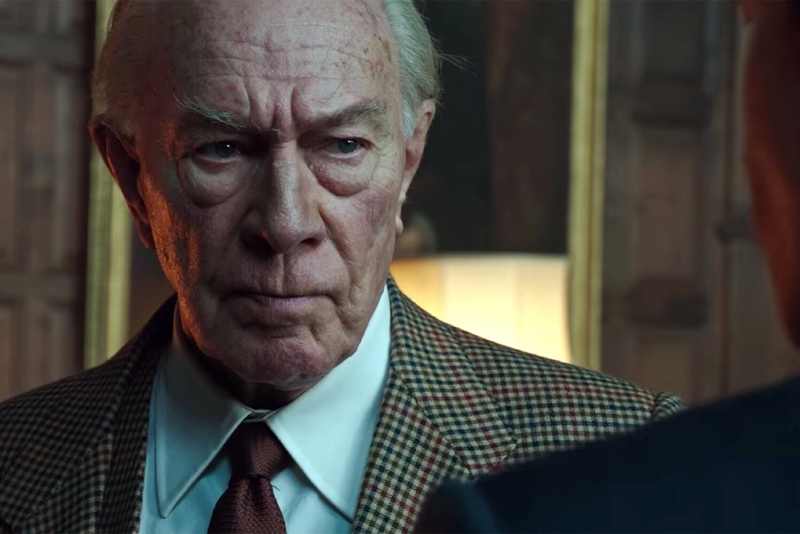 As it currently stands, the most remarkable thing about Plummer’s performance is that I was struggling to imagine what Spacey would have been like in this role. The now laughable publicity stills of Spacey covered in layers of prosthetics to portray John Paul Getty seem remarkably silly, even more so when compared to the sight of an elderly actor giving a commanding performance, no make-up required. It’s one of Plummer’s best performances in recent memory, and it’s strange to think that only a couple of months ago, this performance didn’t even exist- the thought of Spacey taking on this role, likely channeling his House of Cards performance for a more overtly moustache-twirling turn as Getty, would likely have worked to the film’s detriment. Plummer plays Getty as cold hearted, without making him a clear-cut villain. Spacey, on the other hand, would likely camp up an already unsubtle characterisation to forge a pale imitation of his more memorable screen villains throughout his filmography. Criticism of Ridley Scott as a director more interested in the aesthetics of his own filmmaking, rather than directly engaging with his screenplays on a human level, is one that has frequently been hurled his way- especially in the light of emotionally detached recent efforts like the Alien prequels and The Counsellor. All the Money in the World is the rare instance of the director putting his characters first and foremost, allowing the performances to shine. It isn’t a flawless ensemble (the less said about Charlie Plummer’s screechy turn as John Paul Getty III, the better), but the performers manage to embed a believability to each and every role. Plummer’s performance may seem too overtly devious, yet there are multiple keenly observed character details that make Getty seem like more than a mere caricature: I personally loved the observation that he greets his family with handshakes, instead of a warmer embrace. This isn’t just the Christopher Plummer show, however. Michelle Williams is as reliable a screen presence as you’d expect, unveiling the motherly anguish underneath a character who initially seems overly performative, speaking in a high-class transatlantic despite being divorced from the Getty family wealth. It’s unsurprising to see an actress of Williams’ calibre deliver a performance of this strength. In fact, the biggest surprise (aside from the film hanging together as a cohesive thriller despite last minute reshoots) comes courtesy of Mark Wahlberg, in his most striking performance since The Fighter back in 2010. Wahlberg has frequently become lazy with his choice of film projects, favouring cheap comedy and lazy action efforts over dramatic roles he can handle capably, so to see him actually put in the effort and succeed is an unexpected surprise. I’d guess that if it wasn’t for his insufficiently “woke” public persona, his performance would have a stronger resonance throughout this awards season- he overcomes being cast against type in a manner that has previously proved a stumbling block whenever he attempts to broaden his horizons. Hopefully his choice of projects improves, and this is a promising sign of things to come. Above everything else, All the Money in the World is an exquisite thriller, bolstered by a series of perfectly pitched performances. Once the hype about Christopher Plummer’s stunt casting settles down, it’ll be clear to see that this is one of the best films Ridley Scott has put his name to in recent memory- it operates equally well as a prestige-tinged genre effort and as a nail-biting popcorn movie. No, it’s not awards worthy outside of its performances, but as an exciting antidote to the upcoming awards bait onslaught, you could do a lot worse than this.